Mark Allan Keyes graduated from Wilkes University with a psychology degree and is currently a full time State Police Criminal Investigator. Mark is Director of The Pennsylvania Paranormal Association who has been helping people with problem hauntings for more than a decade. The Team has been featured on numerous episodes of Discovery’s The Haunted and several appearances on Discovery’s Paranormal Survivor. He has assisted in the development of research teams in Asia, South America, Mexico, Europe, and the United States. 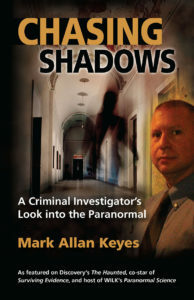 Mark is host of WILK’s Paranormal Science radio; co-starred in the film, Surviving Evidence; and is a noted speaker on the paranormal.